BEIJING - The battle to intercept tarnished meat products before they arrive on the dinner table is continuing across the country but some consumers are saying their confidence has been rattled following a recent scandal in which a banned substance was allegedly found in pork sold by a major supplier. 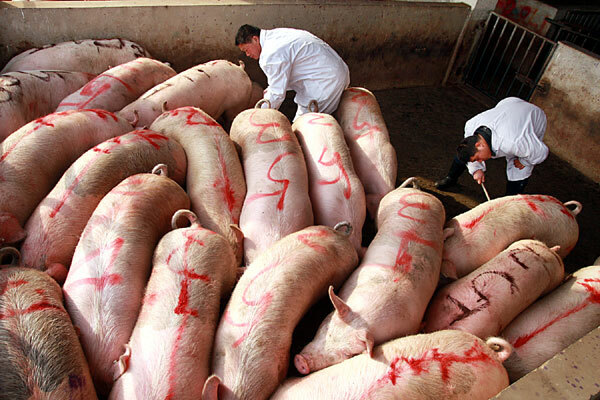 In the aftermath of the revelations, 19 pigs among 689 awaiting slaughter and processing at the Jiyuan Shuanghui Food Co Ltd in Central China's Henan province tested positive for clenbuterol. The illegal additive that is hazardous to humans was detected in the pigs' urine, according to a Jiyuan city government statement on Thursday. The local authorities are investigating more than 1,300 pig farms and 130 feed suppliers and providers of veterinarian supplies, the statement said. The results have not yet been disclosed. Fourteen people, including seven pig farm managers, six brokers and one purchaser from Jiyuan Shuanghui, have been placed in police custody, according to the provincial government. And at least six officials and workers at local animal quarantine stations have been fired or suspended, it said. In addition, meat products that are suspected of having been tarnished by the banned feed additive have been taken off the shelves. All feedstuff and meat confirmed to contain the additive have been destroyed. Li Mengshun, chief of the provincial animal husbandry bureau, said tests will continue throughout the province. The action was prompted by revelations on Tuesday that Jiyuan Shuanghui, an affiliate of China's largest meat processing company - Henan-based Shuanghui Group, had purchased pigs that had been fed the banned substance. Jiyuan Shuanghui was said to have bought pigs that had been fed with clenbuterol. The substance, which is better known as "lean meat power", can speed up the growth of muscles and burn fat, resulting in leaner pork. But it is banned in China as an additive in pig feed because humans can suffer from nausea, headaches, limb tremors and even cancer after eating food containing the additive. In Nanjing city, capital of Jiangsu province, the local government on Thursday suspended the operation of Xingwang Slaughter House after pigs there that were believed to have been brought in from Henan tested positive for clenbuterol. In Beijing, stricter spot checks targeting all live pigs from Henan province and fresh pork products began on Thursday, said Li Bo, a staff member at the capital's animal health inspection institute. "About 10 percent of meat products will be tested. Before, we tested 5 percent of the products," he said.